Comment People are missing one important point about the "Liberator" 3D-printed "plastic gun": it isn't any more a gun than any other very short piece of plastic pipe is a "gun". Seriously. That's all a Liberator is: a particularly crappy pipe, because it is made of lots of laminated layers in a 3D printer. Attached to the back of the pipe is a needlessly bulky and complicated mechanism allowing you to bang a lump of plastic with a nail in it against the end of the pipe. An actual gun barrel is a strong, high quality pipe - almost always made of steel or something equally good - capable of containing high pressure gas. It has rifling down the inside, making it narrow enough that the hard, tough lands actually cut into the soft bullet jacket (too small for the bullet to actually move along, unless it is rammed with massive force). At the back end there is a smooth-walled section, slightly larger, into which a cartridge can be easily slipped. In a real gun, the action slips a cartridge in and holds it there very firmly in one or another way while the firing pin punches the cap in the cartridge base. The propellant powder inside the cartridge cylinder burns very fast, creating a lot of hot expanding gas. The bullet is crammed with terrific force into the too-narrow rifled section, and accelerates extremely fast - acquiring a massive spin from the rifling - as it travels along the barrel with the expanding gas brutally pistoning it along the whole way to the muzzle. The bullet emerges going very fast, having acquired much of the energy released by the propellant powder. It will fly a long way on a fairly straight and predictable trajectory (thanks to the spin and the length along which it was accelerated) and do a lot of harm when it hits something. When the nail hits the cap in the cartridge base in a Liberator, the expanding gas likewise pushes the lead bullet off the end of the cartridge and down the "barrel" pipe. Much of the gas leaks past due to the loose fit and soft material of the "barrel". The lump of plastic with the nail (probably) stops the cartridge case spitting out of the back, which is pretty easy as the bullet pops out of the extremely short, basically smooth* "barrel" almost immediately with very little push from the gas required. Most of the cartridge's hot gas spills out of the muzzle without getting a chance to do any work on the bullet, which is the main reason the cruddy "barrel" doesn't (always) come to bits on the first shot and the cartridge case (probably) doesn't just spit backward into the user's face. The Liberator's bullet emerges going very slowly and wobbling or tumbling due to lack of spin. It might go almost anywhere, though not very far, and is unlikely to do much damage to anything it manages to hit. The only way to be at all confident of a disabling result using a Liberator would be to press it into your enemy's body before firing. This is also true of a kitchen knife, and a vigorously thrown kitchen knife (or half-brick) would be at least as effective at a distance as the "Liberator". It's not a gun. It's not even a 1950s style "zip gun": the pipe used for zip guns is a lot better than you can make in a 3D printer, and is correspondingly more effective - and safer. In a real gun which you would actually carry into a fight, there will also be various ancillary equipment which will mean you can shoot it again without having to manually insert another cartridge. Nobody serious has used single-shot firearms in combat for well over a century. 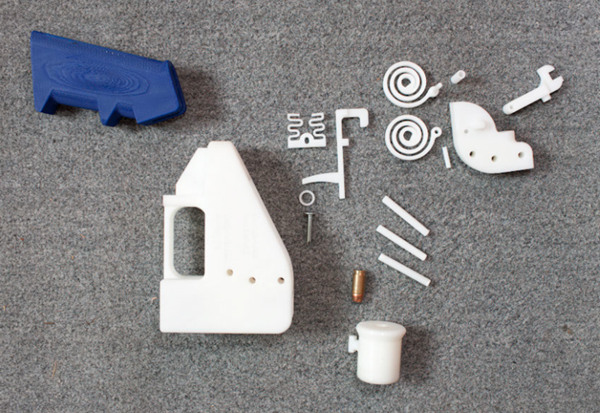 So what we have here is not, as everyone is saying, proof that 3D printers can be used to make guns. It's proof that they can't, and that 3D printing at the moment is basically pretty useless. But my word, people are excited. Anti-gun people are seizing on the Liberator to crank up hysteria against guns, ignoring the incovenient truth that the USA is awash with actual proper guns already and seemingly always will be: it's turned out to be politically impossible to institute any serious controls on real guns there - far less, controls on pieces of crappy 3D-printed pipe. Pro-gun people are seizing on it as proof that guns can't ever be taken away from people by the government, which is even barmier. Even if you have a whole bunch of actual proper guns, if the feds or the cops decide to take them away, they will do so. The only thing that will slow them down at all is their desire to avoid killing or hurting you in the process: your firepower is not a problem for them, and it really won't be a problem if all you have is a Liberator or similar. Even so, we can expect a lot more cobblers to get said about the Liberator, 3D printing etc in the near future. *The Liberator design nominally imprints rifling lands inside the bore, but this is purely cosmetic.